Vogue Italia Feb 11, 2011 Issue - The Black Allure. A 1920's / Harlem Renaissance era with finger waves, turbans and cigarette holders. Franca Sozzani - Vogue Italia's editor-in-chief since 1988 and considered to be one of five most influential people in the fashion industry worldwide said it best "The truth is that real beauty doesn't care for skin color or nationality." The dresses - magnificent in style - from Versace, Ferragamo, Louis Vuitton, Lanvin, Donna Karan and Dior. The jewelry - not for the faint of heart. 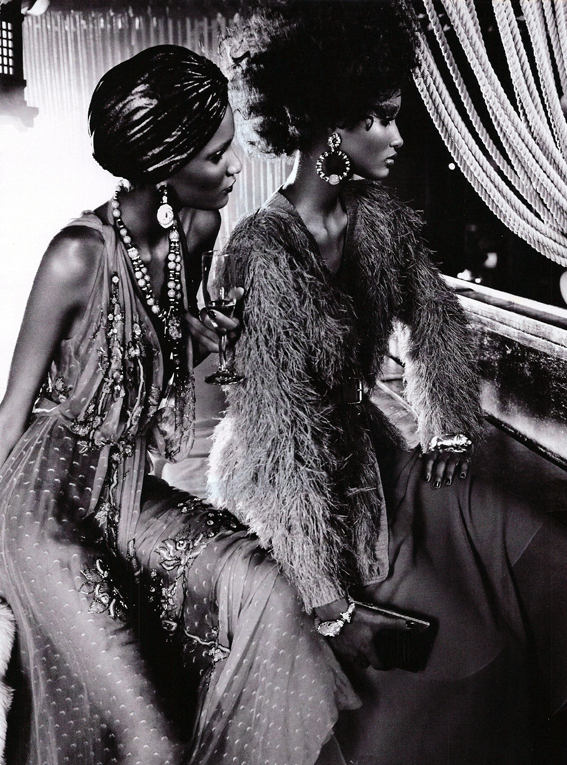 Photographed by Emma Summerton, styled by Edward Enninful. Models - Ajak Deng, Arlenis Sosa Peña, Chanel Iman, Georgie Baddiel, Jourdan Dunn, Joan Smalls, Kinée Diouf, Lais Ribeiro, Melodie Monrose, Mia Aminata Niaria, Rose Cordero and Sessilee Lopez.